In your clients area: in the Messaging menu or from your portals home page. How can I apply for another photo shoot? You can either send an estimate request that we can turn into a invoice if your agree with the pricing or you can use the feedback form on your portals main hub page. The prices given in the Estimate system are a guideline only and the discounts may be greater as we might be running an internal offer at the time, just see what we come back with. The galleries that you have available to you are listed on your hub page and in the Galleries page after you click the galleries menu button. If you have no galleries available to you, this might mean that we are still processing the images from your photo shoot and you will be emailed when there are galleries available to you. The Feedback form allows us both to communicate with each other, this way of communicating is secure and encrypted and no other clients have access to these communications. All communications are kept on our database server and no information is kept on the web server. When you agree wot work with us we created your account on our secure client portal, when we have finished your photo session and have gone through the proofing process you will have a gallery created listed under final images. The galleries are located under the menu button “your secure galleries” and on the home page of your portal. Select what images and sizes that you would like printed and you will see your discounted price for each image you have selected, now all you have to do is add to cart. Prints - Canvas wraps and canvas prints? Canvas wraps and prints are different products the wraps come with a 18mm deep wooden frame and the prints are just prints that you can frame yourself rather behind glass or on a canvas stretcher. Why do we offer canvas prints? Well this is simply for the client to save money and to frame them there selves, as we have stated before many times that we are client and customer focused and we do things differently here at EVE LBS Photography Ltd. This is to answer any questions about the media that we have images printed upon. We work very closely with out Print Lab and only offer the best. Our standard and poster prints use professional archival photographic paper that is stored or displayed properly is guaranteed to last 100+ years. Our standard prints are Glossy Photo paper and at a minimum of 210gsm, and use professional archival photographic paper that is guaranteed to last 100-200+ years (dependent on storage used). Our Poster Prints are printed upon Glossy or standard media at a minimum of 260gsm and This is an excellent quality photographic paper for posters, prints, photographs, charts or pretty much anything. A matte, bright white, fine textured 100% polyester inkjet canvas. Strong, yet easy to stretch and fold without cracking. Can be lacquered or varnished. Posted rolled in a tube and ready for you to mount or frame. An A4 image is 8″x12″ (inches) that’s 800 by 1200 pixels. An A3+ image is 18″x12″ (inches) that’s 1800 by 1200 pixels. An A2+ image is 18″x24″ (inches) that’s 1800 by 2400 pixels. An A1+ image is 24″x36″ (inches) that’s 2400 by 3600 pixels. An A0+ image is 36″x48″ (inches) that’s 3600 by 4800 pixels. If you pay via PayPal, we cannot ship to an alternative address unless you have provided this in PayPal. Please add the alternative address to your PayPal account before completing checkout. We will only post to the delivery address provided in PayPal. All personalized posters and prints are dispatched within 3 working day. CDs are dispatched within 3 working days. Please allow a little extra time for delivery to remote areas like the Scottish Highlands and Channel Islands. Personalized, framed canvases are dispatched within 5 working days from date of purchase as we need to allow them to dry and then we have to frame them and this takes time. “RM First Class Post” is usually a next day service but has no guarantee and can take up to 15 days. Please allow extra time for delivery if choosing this option, especially during busy periods like Christmas and other holidays. We must have payment in full before printing will start. We are not open on weekends or bank holidays for printed products/items. Orders received after 11AM on a working Friday will be dispatched the next available working day. If you want to know our carriage rates, just add what you want to purchase to the cart and postage rates and options will be displayed. As you check out from our website, you will be shown the following postage options for boxed items over 610mm in size. Please make sure you choose the correct option for your delivery location. We offer free shipping on orders over £300 to UK Mainland only (Zone 1)..
AB31-38, AB40-56, FK19-21, PO30-41, BT, IV, HS, KA27-28, KW, PA20-78, PH4-50, ZE, GY, JY, IM, TR21-25. 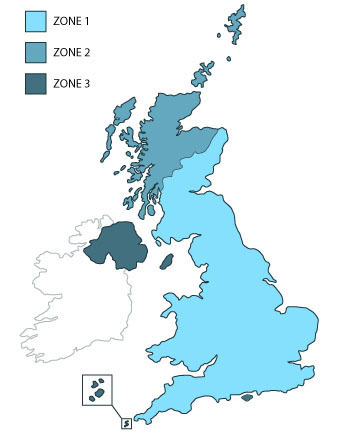 myHermes 5-7 day service for Isle of Wight, Scottish Highlands (most postcodes above) & N. Ireland. myHermes 5-7 day service (slightly higher price) for postodes IM, HS & ZE. Parcelforce 48, 2-3 Day Service to the Channel Islands, postcodes JY & GY.